When I was nine years old we moved to Northern Virginia where Jewish food wasn’t so easily attained. If I wanted a corned beef sandwich I usually had to wait until family trips to South Florida. They always included a visit or two to the sadly, now-shuttered Rascal House. My favorite things about the Rascal House were the bottomless plates of sour pickles, pickled tomatoes, and the basket of assorted rolls. I always made a mad dash for the salt sticks and pumpernickel rolls. I remember my parents proudly telling me that occasionally they sat separately at the counter, just so they could each get their own bread basket. I guess that my food obsession is an inherited trait. Nowadays if I want a corned beef sandwich, I head over to the Corned Beef King, a Montgomery County-based food truck which now has a carryout location in Olney. Their sandwiches are pretty darned good. So when I hear that DGS Delicatessen is open in DC’s Dupont Circle, I am not necessarily jumping up and down, but I am interested. What intrigues me most is that the Jewish-style deli is not opposed to reinventing classic dishes. I am all for tradition, particularly Jewish tradition, but when it comes to food I usually don’t mind updates. I’m here with a my husband and a friend who grew up in Long Island. I’m anxious to hear her thoughts, because New Yorkers are notorious for saying that nothing compares to the food back home. (don’t tell them this, but in general I happen to agree). Before we even sit down I know some of the dishes that I want to order. Kasha varnishkes is a must. The French fries with Zaatar spice sound appealing as well. I’m less certain about which way to go in terms of a sandwich. Corned beef or pastrami? My friend says she’s willing to share a sandwich. I like this idea as it will leave room for dessert. We agree on a corned beef Reuben. Now all I have to do is select a drink. The Bridgetown Apple Royale strikes my fancy with its autumn flavors: Dupont Calvados, Pyrat Rum, spiced apple, lemon, and maple bitters. I have chosen wisely, as the spice counteracts the sweetness. It’s a perfect way to take the chill off a cold night. DGS pays homage to Jewish food, but it’s not Kosher. There are plenty of menu items available for the Kosher-keeping crowd, which includes my husband. Sandwich options include salmon pastrami, white fish salad on challah, and an eggplant Reuben, which he orders. He thinks it is a good sandwich, although the bread is a little over toasted and the eggplant a tad bitter. The corned beef Reuben is traditional, topped with gruyere, a fairly mild sauerkraut (which I think is a good thing), and Russian dressing. The double-baked rye bread is nice and crunchy. We agree that the meat, which is corned in-house, is worth the trip from the suburbs. My friend washes her meal down with a Dr. Brown’s cream soda, a nod to her childhood deli memories. My husband is a Dr. Brown’s cel-ray kind of guy. 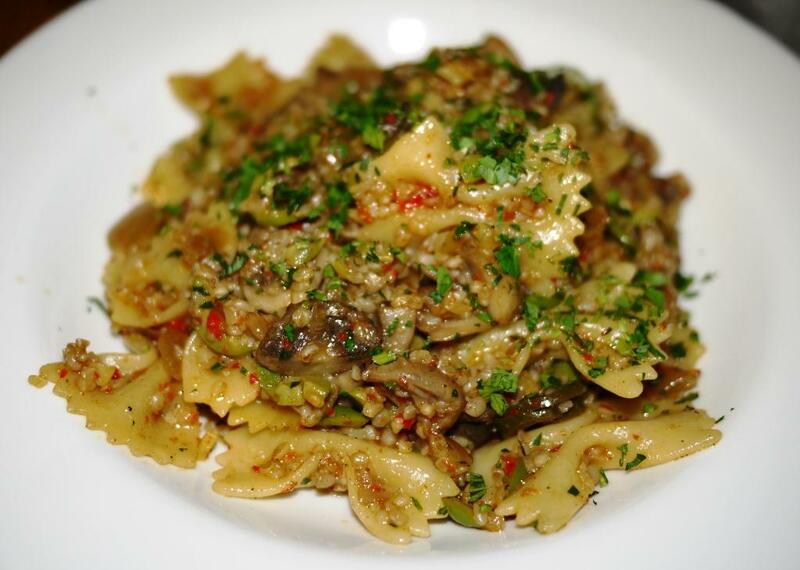 I am a big fan of the DGS reinvented version of kasha varnishkes, which incorporates Middle Eastern accents such as olives, harissa, and preserved lemon. It’s reminiscent of my grandmother’s version, but with tons more flavor. Portions come small ($8) and large ($15). The small is plenty for three to share as a side. I like the Middle Eastern twist on the fries, which are accompanied by a roasted garlic yogurt dip, although a sprinkle more Zatar would have made them even better. Sandwiches are accompanied by a house-brined pickle slice, but one slice is not nearly enough for me. 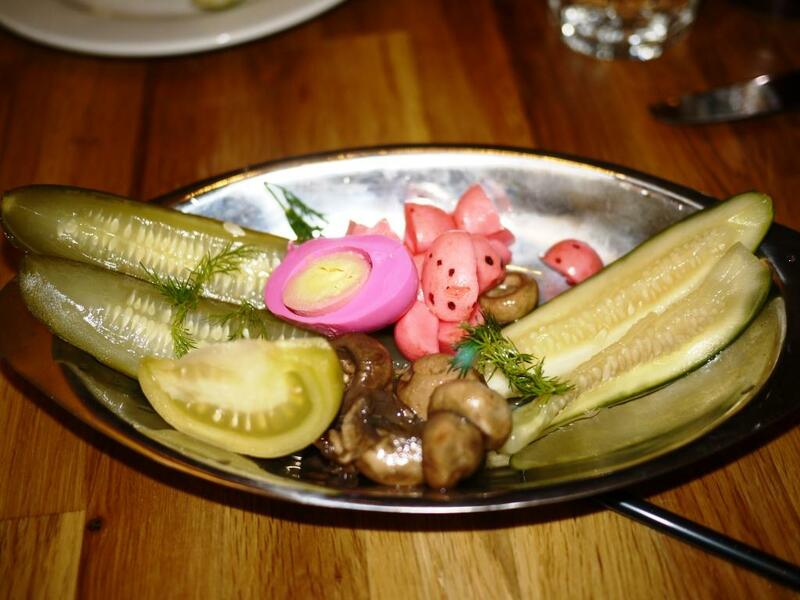 A pickle plate is $5, which may not sit well with some. But I believe the sour pickles and pickled carrots are necessary accessories to a deli sandwich. I would much prefer that they be included with the meal, but it’s not worth skipping based on principle. I’ve left room for dessert, as blogger Jenna Golden from Eat More, Drink More has tweeted that the babka bread pudding is a real wow and not to be missed. My freezer is almost never without a babka and I always find bread pudding irresistible, so this is a no-brainer. I would have been content with one dessert, but my husband orders DC style cheesecake topped with pomegranate seeds. 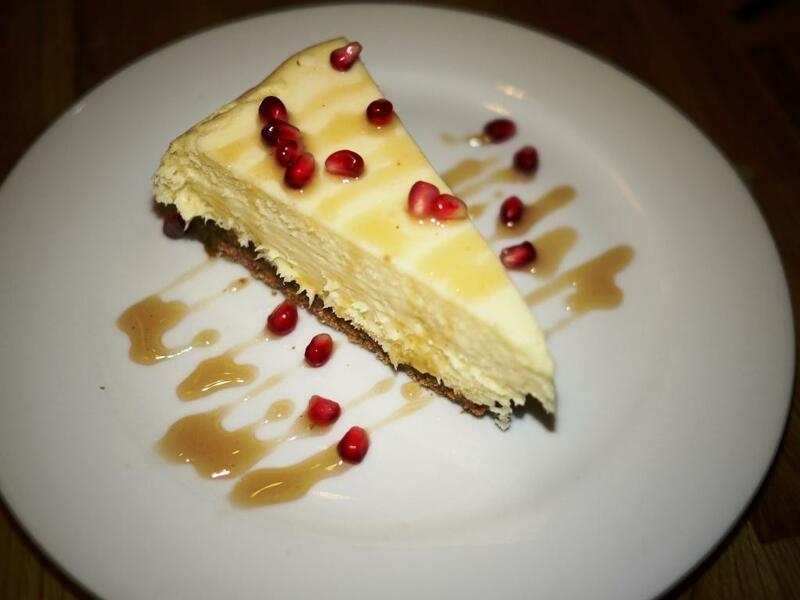 The DC cheesecake is smooth and creamy and the pomegranate seeds are a nice touch, but it lacks flavor. My friend doesn’t have to say it: DGS would have been better off going with a New York style cheesecake. 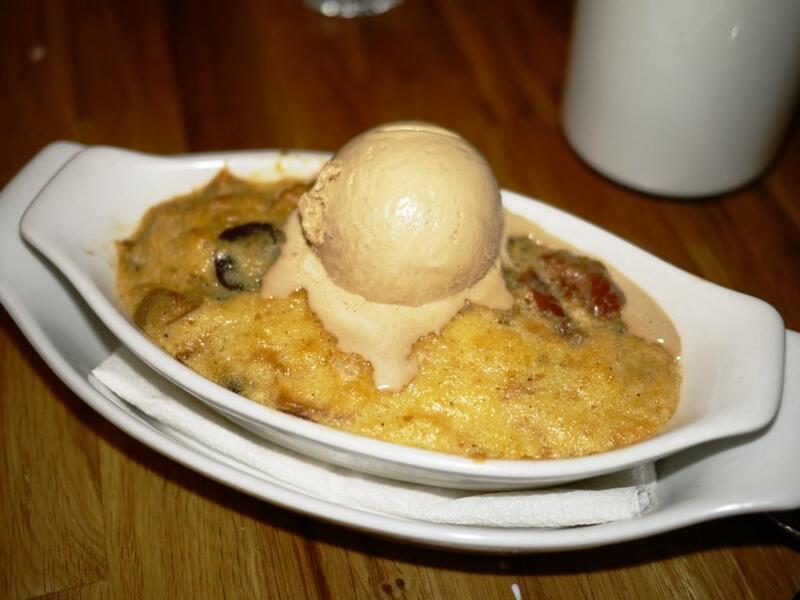 The babka bread pudding with cinnamon ice cream is a far better ending to the meal. I love the reinterpretation of babka, which combines warm cake with cold cinnamon ice cream melting into gooey bits of chocolate. I’m grateful for my earlier restraint in eating only half a sandwich. Our service here is flawless, particularly when you consider they’ve barely been open a week. As we’re eating a young employee walks by, then stops and informs my friend that there is a price tag hanging out of her shirt. Is it okay if she tucks it in for her? Wow. 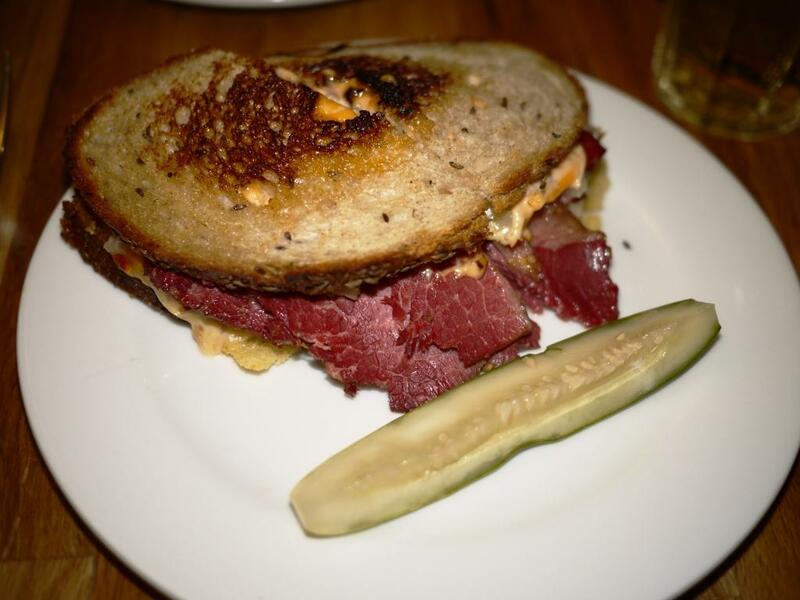 DGS Delicatessen not only has food that conjures up childhood memories, they serve it up with a modern take on a Jewish mother.